On April 7, and over the weekend, Michael E. Mann and Peter Gleick twittered about 2014 being the driest and hottest year on record for California. 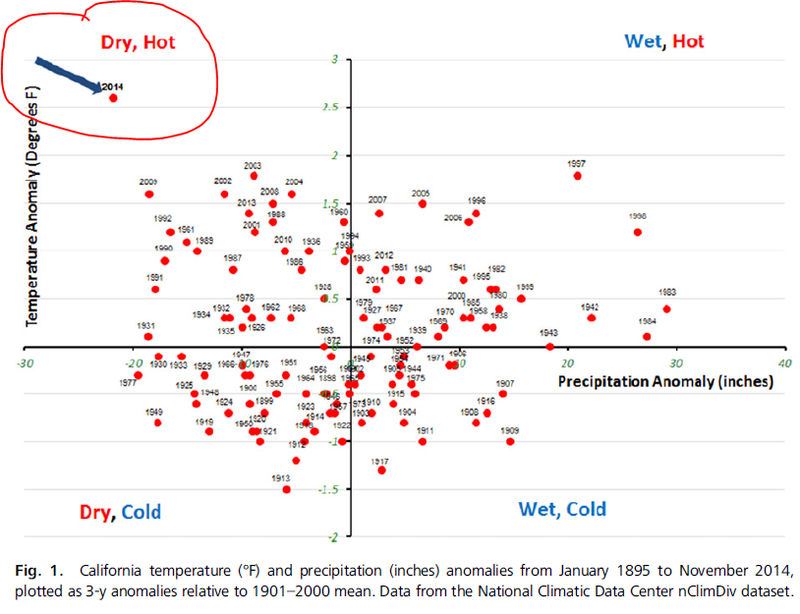 They provided a graphic from their recent PNAS article, "Climate change and California Drought in the 21st century." The twitters included a graphic which depicted the heat and precipitation anomalies from 1895 to 2014, with last year marked as a glaring outlier compared to the entire record. The graphic above does not include 1999, which I could not locate. What is troubling is that the temperature anomaly for all years is above the 1901-2000 mean. The other observation is that even though the last 18 years are all warmer, only two of the last four (with this baseline) are drought years, and there is an equal balance of drought and excess precipitation in the 18 years since 1996. However, since 2000, only 6 years have been wetter than average, and eight have been drier. Time will tell on what 2015's final result will be, but the drought does not seem anywhere close to ending.